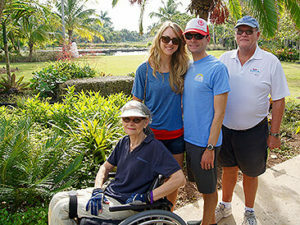 Collene Van Noord was one of last year's NMEDA Local Heroes contest winners. The former superintendent of a PennsylvaniaK-12 school district had just retired the previous year and a little over six months later was in a serious car accident after dropping her husband off at the airport. 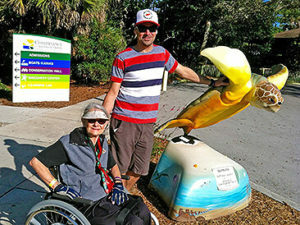 Collene, of Michigan, became a T6 paraplegic at a time when she and her husband were making plans to go to San Diego to see their grown children, bought newbikes to take on trails, and preparing their sailboat for days on the water. Two weeks in intensive care in Ft. Myers, Florida, two months of in-house rehabilitation in Grand Rapids, Michigan, and four months of outpatient rehab later, and Collene was now outfitted in a wheelchair and a new outlook. For a year after the accident, Collene would transfer into the passenger seat of their vehicle. 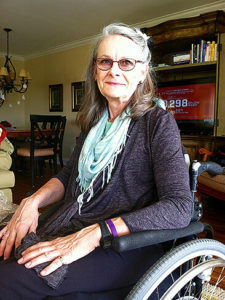 Collene's husband had the job of then breaking down the wheelchair and stowing it either in the backseat of the car or into the trunk, whichrequired taking off the wheels to make the chair fit. 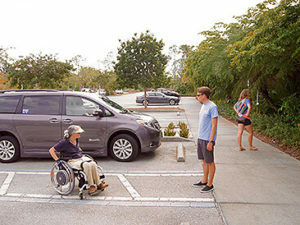 Her wheels, being E-motion wheels, weighed 25 pounds a piece, and Collene was worried he might reinjure his back lifting her equipment into and out of the car. After the accident, Collene's daughter-in-law, a neurologist, explained medically and in lay terms what was happening during Collene's recovery on her care pages online. Once Collene was better, she updated her own page and eventually moved her recovery story to her own blog called FastHugs: The Road to Recovery, after the mnemonic for remembering the key issues to review when looking after a critically ill patient. She and her husband kept busy in their community, and Collene was active on her blog trying to help her new community of people with disabilities. In fact, Collene says, her community was probably bigger than most. "We lived in Lansing for 28 years raising our children, working, and developing friends with whom we kept in contact...My husband was CIO of the state employees' and educators' pension systems in Michigan and Pennsylvania, through which he developed colleagues across the country." With her students' children grown and forming ties of their own, her children in California and their friends, and friends Collene and her husband made in preparation to move to Florida, her supporters numbered in the hundreds, if not thousands. Her sister one day saw a segment on Fox17 in Grand Rapids about NMEDA's Local Heroes contest and sent the link to Collene. Her immediate thought was that "Nobody ever wins those things," thinking back to contests promising cruises and vacations to tropical islands. At this point, FastHugs had grown to a large community, with over 4,500 hits and now receiving visitors from 29 countries onevery continent except Antarctica. "I called Kadi De Haan from Clock Mobility. She had been on the Fox17 segment and Clock had adapted our Malibu the prior summer. She gave me invaluable advice. She said to write about how I had persevered and continued to serve others, not why I needed the van. Everyone who enters needs the van; write about how I was a Local Hero." "Trust me, claiming to be a Local Hero is daunting. As I had been reading reactions to my CarePages and blog, I heard repeatedly how I was inspiring others. I had kept thinking, 'But it's just me. I'm no different from others.' What Kadi told me rang true with what others had been telling me. That gave me the impetus to proceed." Local news stations picked the story up and helped spread the word about the contest and Collene's story to the local community. Votes began pouring in. After she was informed thatshe won a vehicle, Collene and her husband held on to the secret and their excitement for two full weeks before NMEDA announced her as a winner to the public. Though it's only been a year, Collene is in love with her BraunAbility van, aptly named Van Gogh. "Number one, I can drive, because I don't need someone at the other end who knows how to reassemble my wheelchair and get me into it. But even beyond that, when my husband and I want to go someplace, it's not a matter of, 'Well, is it worth all the time and the effort or the risk or the danger?' weighed against the value of whatever it is we were going to go to," Collene explained. "We are much more available to go and much more apt to go places and enjoy what's going on and participate in things." "I can't even put words on how wonderful it is. It doesn't allow me to walk, it doesn't allow me to stand, but the mobility and the ability to get around...that portion of our lives is just so much easier." Collene is even in the process of writing a book for children with physical disabilities. "Knowing the perspective of children and their families as an educator and superintendent and now knowing what it's like to be in a wheelchair, I think I can pretty much predict what people are fearing and what they are concerned about," she said. Her book will focus around examining the challenges chair users may face growing up and how to take steps in overcoming them. Between this new project and her dedicated followers of FastHugs, Collene is helping to share her experiences and advice for thousands of readers. To this day, Collene still meets strangers who voted for her through the web created by her supportive community. "This fall I went to my niece's outdoor wedding. It was informal and I was sitting in my wheelchair along the aisle of folding chairs. As the wedding party walked to the back after the ceremony, their minister, whose name I didn't even know, followed them. He walked directly up to me, extended his hand, smiled, and said, 'FastHugs. I voted for you every day in May.'" Life has certainly changed for Collene after the Local Heroes contest. She has some advice for anyone thinking of entering this year's competition. "You've got nothing to lose. Take the risk of putting yourself out there. What they need to do is talk about how they persevere through, how they remain positive, what they are doing in their realm of existence to make the world better for somebody else." "Everybody has stuff in their lives. Some you can see, but a lot of the stuff you can't see. It's about what you can still do to remain positive and make the world around you a better place to live. And that's the bottom line."